How to Get More Instagram Story Views INSTANTLY! Learn how to get more Instagram story views instantly with these FREE easy to follow tutorial. Gain hundreds, even thousands of organic views on your next story with this simple hack you need to know! Need to Add Multiple Links to Your Instagram? Then TRY This! The easy trick to adding more Instagram links to your bio! Adding a variety of links to your social media platforms couldn’t be easier with this step by step guide. Facebook pages are one of the greatest resources for bloggers and businesses in any niche. This is because Facebook’s CTR (link click through rate) is incredibly high compared to other platforms. This makes Facebook invaluable. For those who aren’t familiar, CTR is the metric representing the number of people who click on a link you share. This link can be a blog post, website, YouTube channel, email list, product for sale, and more. For most businesses, this link is the purpose behind having a Facebook page in the first place. However, one of the biggest misconceptions about Facebook is that you have to “pay to play” now. This is absolutely not true, and I’m going to break down why this isn’t the case below. I started playing around with a Facebook page about a year ago. At this point I had little knowledge on how the platform actually worked (outside of my personal account). However, I didn’t let this stop me and instead kept posting and taking notes on the patterns that I noticed. Then… I took Hannah Hudson’s “Beating the 1%” seminar (and eventually course) and my Facebook page engagement and growth went through the roof. To further your knowledge you can check out Hannah Hudson’s website here - and if you want to learn more about the algorithm make sure to enroll in her HSH Teachable course. I now reach tens of thousands of people for FREE. I did this by giving Facebook what it wants (organic content) and providing an interacting platform. You can check out my outdoor Facebook page here as evidence. Over the course of roughly one year I’ve EARNED all of my likes and follows; therefore reaching tens of thousands of people. I reach tens of thousands of people with 5,000 hard earned followers. 2) Your followers who share have built up engagement of their own. Therefore having quality accounts engage in your content is essential to organic growth. You have to earn your engagement or Facebook won’t show your content to anyone - even if it’s shared to a group. In conclusion, you need to post high quality, original content frequently and then interact with the followers who interact with you. You don’t want this. Take your time and do it right. Now that we have established a baseline, below are 5 ways that you can grow your page and engagement for free. This is a simple and an incredibly efficient method to grow any page. The key to this strategy; however, is to post quality content consistently. Don’t post links, re-shares, memes, or other content randomly. Instead, post organic/native content. This is the content Facebook prefers and therefore will freely promote to other individuals. This allows more likes on each post. The more likes you have on a post, the more people you can invite to like your page as shown below. As you can see above, once you click on the “Likes” it will open up a platform to “Invite” people to your page. Do this by clicking the “Invite” button as shown by the red arrow above. Do this on every Facebook post you choose to publish. Don’t be afraid to go back to old post and invite other people as well. Facebook groups are incredibly beneficial to any marketing strategy. They help individuals make connections, support each other, ask questions, and even grow their Facebook pages. In fact, I have an in depth article on Facebook groups called the “Secret Way to Explode Your Blog Traffic” if you wish to learn more. One of the biggest ways it can help you grow your page is through sharing directly from your page to the group. The key to this is “sharing” and not directly posting. Many people organically post to groups, which is great, but not going to help you in this particular goal. To help clarify I have added a tutorial below. Share high quality Facebook posts directly to groups to reach more people and receive more views. The post above has been shared in Facebook groups, thus leading to over 11,000 video views. Exposing this video to groups has also led to more views, increased engagement, and a significant increase in Facebook page likes and follows. Go to the bottom right hand corner and select “Share” as shown in the image below. 2. 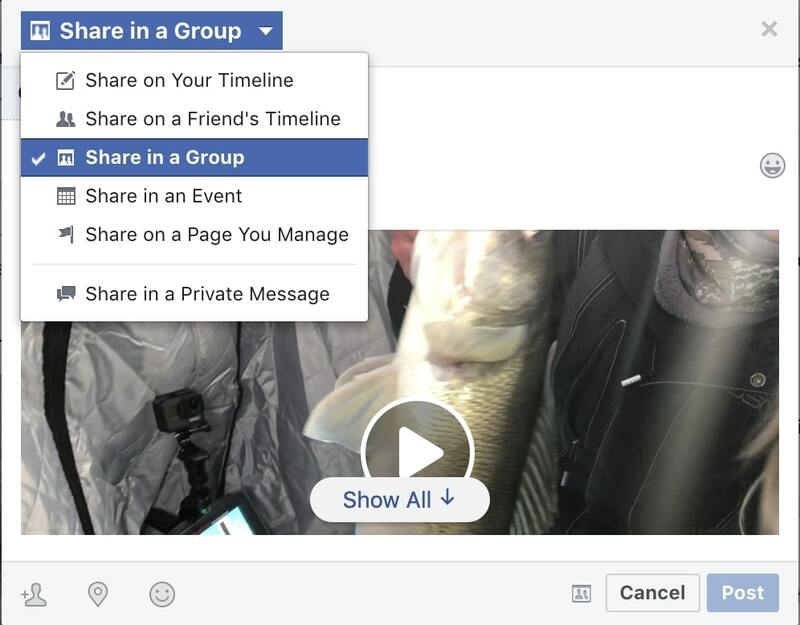 Next, you are going to want to select “share in a group”. This is NOT the default, therefore make sure you select the right one. 3. Finally, type in the box the name of the group you want to share to and add a quality caption as shown in the image below. 4. Then hit “post” as shown in the bottom right corner in the picture above. That’s it! You have successfully shared a post to a Facebook group. Just keep in mind that not all Facebook groups allow this; therefore check the group rules before posting. Above is an example of a social media share thread where you can share your Facebook page with others. This thread encourages social media sharing. As a member, you can drop a link to the social media platform of your choice while reciprocating engagement with five others. This is easy to do and very beneficial. Just like with big Facebook groups, shares from big (and engaging) pages are essential to growing your page quickly. For instance, when a large Facebook page such as Wide Open Spaces share my post, I have access to a big chunk of their audience. If this audience likes my content, it generally leads to more Facebook page follows and likes. If Wide Open Spaces gets a solid response from their followers (likes and comments) they will keep sharing my content and therefore more of their followers will keep liking my page. This can bring sustainable page growth over time. When large accounts share my post, my page link gets shared as well - leading to more followers. Trying a variety of these tactics can often help gain the attention of larger brands and pages. Did you know you can invite your personal Facebook friends to like your page? If you are willing to sacrifice your personal account for your brand or business then this can be an incredible way to grow your page (and improve your engagement). This is one of the things I do. I accept friend requests from everyone who has a profile in my niche and looks respectable. I then invite these individuals to “Like” my page as shown below. I find that the crossover allows me to have a higher reach as well. To do this, you need to locate the community tab on the right hand side of your Facebook page. Under this tab there should be an “Invite Friends” button as shown below. After you tap the “Invite Friends” button a feature should open up allowing you to invite your friends to like your page. This is demonstrated below. You can invite your personal Facebook friends to like your Facebook page as shown above. Then simply tap the “Invite” button next to all of your friends names. That’s it! Learn what your audience wants and when. If people don’t respond well to a post then take a note of it. It's through posting quality content in a consistent manner that you can build a real and engaging following. 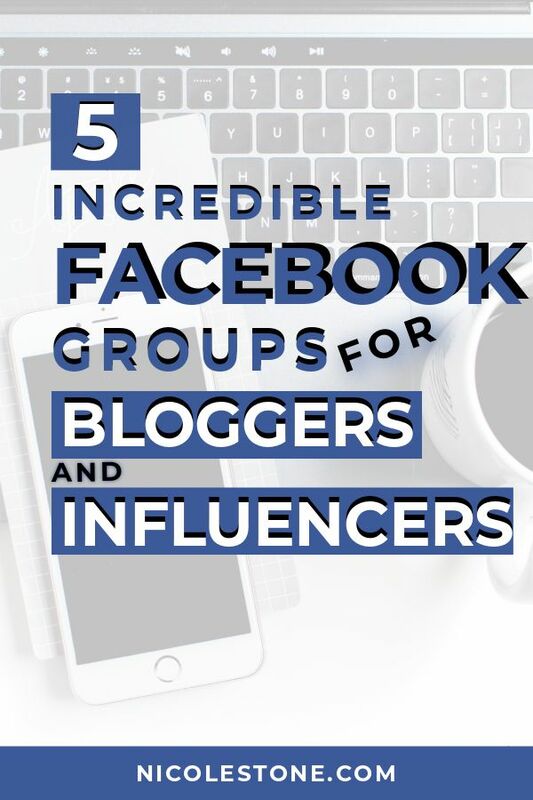 5 Facebook Groups That EXPLODED My Blog and Business Traffic! *Yes I have affiliates - it' show I help keep this free information FREE! However, it's products that I beleive in and comes at no extra cost to you. Facebook is an INCREDIBLE source of website and blog traffic. I recently wrote a post how Facebook groups started my blog off on the right foot. It helped drive traffic, increase Pinterest rep-ins, gain Pinterest follows, and increased my Google SEO rankings. However, I must add that it also brought my Facebook page to life. In face, my Nicole Stone Outdoors page now has thousands of followers and reaches tens of thousands of people per post. However, as I mentioned in Facebook guide, it’s about the quality of the groups - not the quantity. That’s why I’ve compiled a list of my FAVORITE groups. These groups have ACTIVE members and keep well-managed collaboration threads. You can also learn about my 5 unique strategies for building traffic (what’s helped me break the 50,000 pageview mark). I use Blogger’s Unite as many times as possible during the week. This is because it is the ultimate group for Pinterest users. There are active “re-pin threads” ever single day. This gives you tremendous opportunity to share your pins that need a boost and build long term momentum. It also has over 7,000 members and is continuously growing. Check out Blogger’s Unite by clicking here. One of the best ways to generate Pinterest authority is through pinning directly from your website/blog. Groups like Blogging For New Bloggers allows you to share these links with fellow bloggers. The group offers numerous different blog comment and share threads including a generic “Share Day”, a “Blog Share Day” “Comment Day” and even “Social Share” days (when you can share any social media platform of your choice). This is one of the BEST groups for building an audience. Blogging for New Bloggers is ran by Lucrezia and Marina from https://tinylovebug.com/. You can join Blogging For New Bloggers here. This is one of the most, if not the most, beneficial group that exists on Facebook. Michelle is world known for making millions of dollars from blogging. Making Sense of Affiliate Marketing is her Facebook group. She not only gives you access to very high quality collaboration threads but also gives you direct access to HER. It’s like having a free consultant - FREE advice from someone who has literally made millions at blogging. She answers questions, helps motivate you, and has some of the world’s biggest bloggers in her group. This is a must have for success (it’s also my favorite group). You can grab Michelle's course and INCREDIBLE Facebok group "Making Sense of Affiliate Marketing" here. Boss Girl Bloggers is huge. It has over 30,000 members and is growing. It also works by providing tons of exposure to both your blog and your brand. However, where Boss Girl Blogger’s stands out is in its Instagram promotion. There is even a sister group that is exclusively Instagram collaboration threads. Therefore if Instagram is your thing - then DEFINITELY take advantage of this group. Of course, the weekly blog promotion and general conversations are bonuses as well. Members are very active and passionate - and you will get a solid return on your time investment. You can check out Boss Girl Bloggers by clicking here. The social Media Network Group is for the serious influencers who want to build up their followings in ALL social media and search engine platforms. It has over 18,000 members and focuses on more specific goals such as improving your Alexa ranking and building up your YouTube ranking. It’s important to note that these require reciprocating with everyone. I normally suggest people shy away from such large time commitments; however, the shear amount of promotion that this group offers makes it well worth it. You can sign up for the Social Media Network Group by going here. The key to success is staying consistent. These groups all offer HUGE benefits. Therefore participating in them as much as possible should be your goal. Remember, these groups only work if you work. Therefore reciprocate with others, make friends, and most importantly don’t be afraid to ask questions! You can find my in depth Facebook suggestions by visiting my article “How to Explode Your Traffic With Facebook”. Also check out How I Made My First 1,000 Blogging to learn my early blogging secrets to how I went full-time. 10 Social Media Marketing Tips You Need to Know to Bring Your Marketing Game to the Next Level! If you aren't on Twitter you need to be! In fact, it's so important that I've created a guide to helping you get on your feet and gaining followers in no time at all. Learn exactly how to gain your first 1,000 Twitter followers in less then 10 minutes a day!